It was slated as a heavyweight tilt between the WHL’s top two point-getters on Wednesday, and from that standpoint, it did not disappoint. 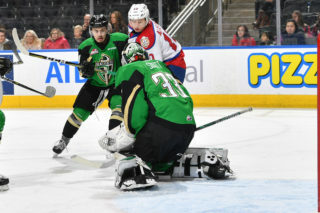 Trey Fix-Wolansky potted his second career hat trick, but Brett Leason countered with three assists of his own as the Prince Albert Raiders (25-1-0-0) emerged victorious, 6-3, over the Edmonton Oil Kings (14-10-2-2) in front of 5,449 fans at Rogers Place. Fix-Wolansky now improves his season point totals to 18 goals and 37 assists for 55 points in 28 games. He currently sits at 198 career regular season points (74G, 124A) in 169 games over his two-plus seasons with the Oil Kings. 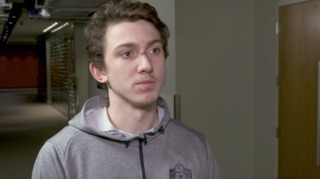 Leason maintains his four-point lead in the League’s scoring race by upping his totals to 26 goals and 33 assists for 59 points in 26 games this season. Dylan Myskiw (11-6-2-1) suffered his first regulation loss in 13 games dating back to October 13 vs. Seattle, surrendering five goals on 34 Raiders shots. 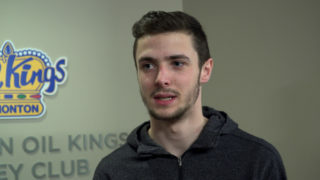 Ian Scott (21-1-0-0) extended Prince Albert’s win streak to 17 games by earning his 15th consecutive victory, stopping 29 of 34 Oil Kings shots and raising his save percentage on the season to .944 and lowering his goals against average to 1.59. The Raiders opened the scoring when a puck strewn towards the Edmonton net deflected off the skate of an Oil Kings defender and past Myskiw. Max Martin got credit for the goal, from Sergei Sapego and Parker Kelly at 4:20 of the first period. It was 2-0 Prince Albert just under ten minutes later as Kelly notched his 12th of the season, from Noah Gregor and Jeremy Masella, at 14:12. Kelly’s second of the game extended the Raiders’ lead to 3-0, from Sean Montgomery and Brett Leason, at 17:00 to wrap up first period scoring. Shots on goal in the opening frame were 12-11, Prince Albert. 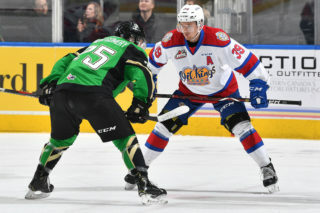 Trey Fix-Wolansky got the Oil Kings on the board just 24 seconds into the second period, cutting the Prince Albert lead to 3-1, unassisted. But the Raiders restored their three goal lead, making it 4-1 on a goal by Brayden Pachal, from Leason, at 3:54 of the frame. Just over two minutes later they extended the lead to 5-1 as Aliaksei Protas notched his sixth goal of the season, from Martin and Ozzy Wiesblatt, to send the game to the second intermission. Prince Albert also led in shots, 22-19, through 40 minutes of play. For a second straight period Fix-Wolansky barreled out of the gate after the drop of the puck, this time scoring just 16 seconds into the third period to cut the Raiders lead to 5-2, again unassisted, for his second goal of the game. Just over two minutes later Fix-Wolansky scored his third of the game, his 18th goal of the season and second career WHL hat trick, to make it a two-goal game, 5-3, from Scott Atkinson at 2:21. 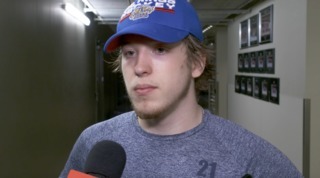 But despite playing their best period in the third and climbing back to within two, it was as close as the Oil Kings could come to mustering a comeback as Kody McDonald scored his fourth of the season into an empty net with Myskiw on the bench in favour of an extra attacker. Leason and Cole Fonstad picked up the assists on the goal at 18:41, to ice the 6-3 final. Final shots on goal after regulation were 35-34, Raiders. Prince Albert was 0-for-3 on the power play while Edmonton finished the night going 0-for-4 with the man advantage. Noah Gregor (PA) (3), Parker Kelly (PA) (2), and Trey Fix-Wolansky (EDM) (1) were selected as the Three Stars of the Game. 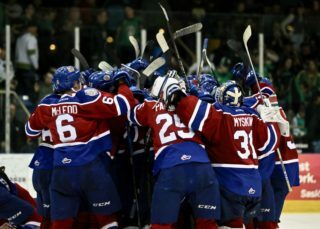 The Oil Kings are back in action on home ice on Friday, November 30 when they host the Moose Jaw Warriors at 7:00 PM MT.